5 Position York Weight Bench Review - Includes Video! The budget-friendly York weight bench is surprisingly well made and designed, it’s sturdy, versatile and built to last, which is what we want to see from any weight bench no matter the price tag. With 5 adjustable back positions from flat to full incline, this bench will cater for nearly all of your upper body workout needs. 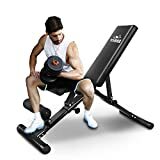 Great for incline and flat workouts you can use the York bench for dumbbell and rack work, and it’s tough enough to take its 200kg weight load, the 200kg weight capacity should be enough for most people starting out weight training. A quick look at the product description then we will take a more detailed look at this excellent bench from York Fitness. The York 5 position weight bench will not suit all lifters, it’s been built and designed for the beginner to intermediate. Weight capacities are normally the first indicator as to who bench is made for, with a 200kg max weight and remember this includes your own bodyweight, we’re looking at low to mid-range here for capacity, top end benches come in at around the 400kg mark and target the serious bodybuilders and strength trainers, the cheapest budget benches at 150kg or so. An average guy weighs in at about 75-80kg a women’s 60-70kg this would still mean you have room to lift up to another 120kgs once you have deducted your body weight from the max capacity of the bench, and if you don’t see yourself lifting that kind of weight any time soon, then this bench will be suited to your lifting needs. Tip- If you take your training seriously and workout regularly your be surprised how much your strength can grow, in a years time you will be lifting more and putting on muscle mass, remember to take your strength and weight gains into account before you buy any piece of gym equipment! York fitness is headquartered in the UK, York used to be two separate companies based in the US and Canada. York fitness is best known for making budget-friendly weight and strength training equipment but they have now branched out into boxing, exercise machines including elliptical trainers, and bikes plus a commercial gym division making this company a powerhouse among fitness equipment brands. The York bench is quite light at 20kg making it very easy to move around your workout space, the bench also has transport wheels integrated into the rear stabilizer which is nice to see on a lower priced bench and this one also folds flat for storage so you have no worries about folding it away if you are training in tight quarters. What we like most about the design of the York fitness bench is that all four corners of the bench touch the floor, I prefer this to the tripod designs that can become unstable in higher incline positions, so a thumbs up here for stability. 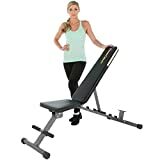 On the negative side, the back support seems to be slightly short and people over 6’2″ may struggle, back support length is only really an issue for decline workouts but as this bench hasn’t got a decline unless you are exceptionally tall most people shouldn’t need to worry about the length of the back support. No reports of this bench being too difficult to assemble with an average assembly time of 30 mins. York also supply you with a numbered picture instruction leaflet and two spanners for the job, I’d suggest using an adjustable spanner to get the job done quicker. What’s surprising about this bench is the quality of the build, the solid and durable tubular construction make this a strong bench which should take its 200kg max weight load. 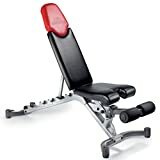 The thick padded upholstery is not overly comfortable to make pressing exercises unstable, and it’s not too hard to make your workouts uncomfortable, York seems to have got this part of the bench design just right and you would hope so with all of their years of experience in home gym equipment. Its really nice to see the ladder adjustment system on a budget-friendly weight bench, ladder adjustments systems are fast to adjust and in my opinion are a much more durable design than the pin locking systems. With 5 positions the York bench is versatile, it’s fantastic to see a full verticle position for seated shoulder presses something you do not see too often at this price, many lower end benches will stop short of verticle and can lead to you buying another bench just for this angle. No decline with the York bench and to be honest nothing to stress about, if you want to add muscle to your lower pecs go for dips, they add mass quicker and are more beneficial to lower pec development than decline pressing, decline pressing is overrated. Summary One of the best adjustable benches you can buy for under £100. 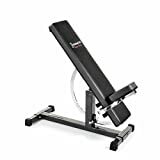 A solid versatile weight bench with enough weight capacity to suit many weightlifters needs, a great bench for dumbbell workouts and even for some power rack work. Overall I'm impressed with this bench, it should make a very useful addition to anyone's home gym.